The Hallnberg is located right next to Erding and is also a premium partner of Europe’s biggest SPA. 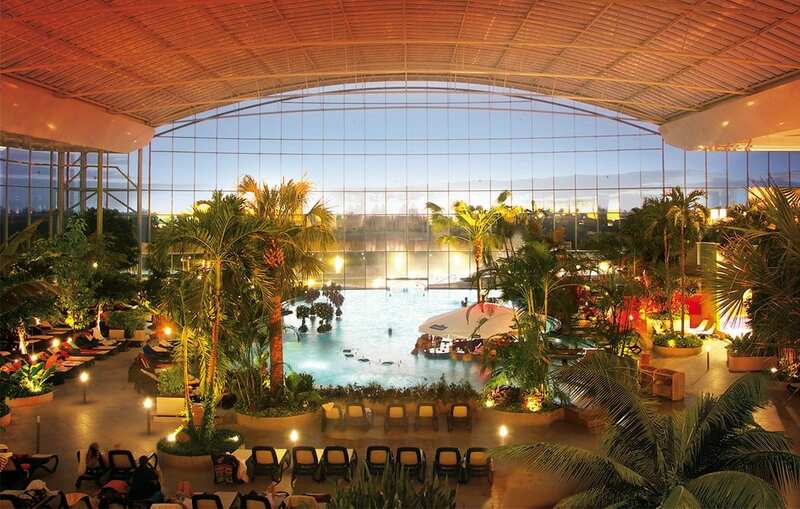 As a partner hotel we offer various types of arrangement’s which include accommodation, breakfast, 3-course menu, in conjunction with a voucher of the „Therme Erding“ For a family holiday we offer arrangements for your whole family. 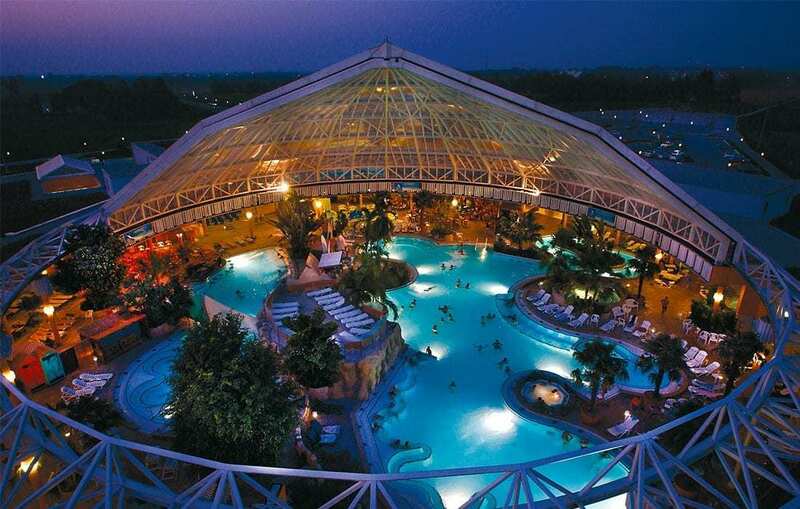 From our family owned hotel you reach the „Therme”within 10 minutes by car (8km). A holiday in Erding is the perfect time to relax and to get the feeling of being right next to the ocean. 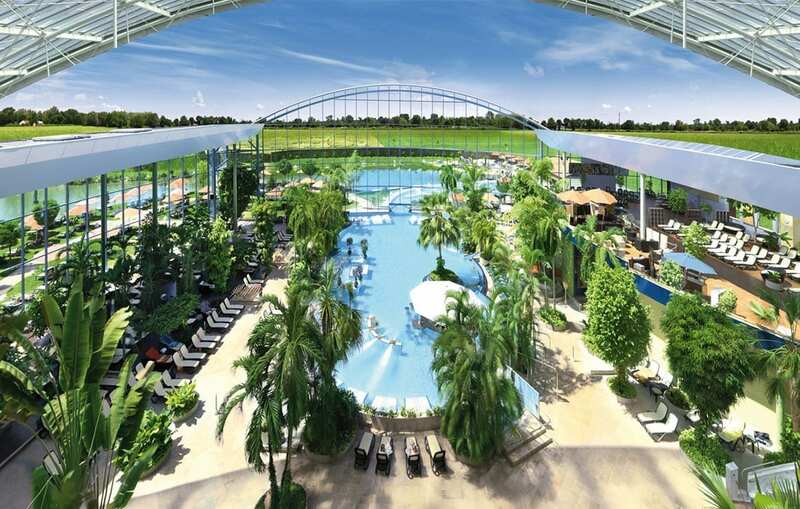 Therme Erding provides you with various activities for every age, whether it is the water slide world, the vitality oasis or the generous spa area. Feel the power of nature when you are in the soothing, state-approved thermal water of the Therme Erding, dedicated to your health. From a depth of 2,350 meters, the 63 ° C hot water for the therapeutic sulfur springs springs. 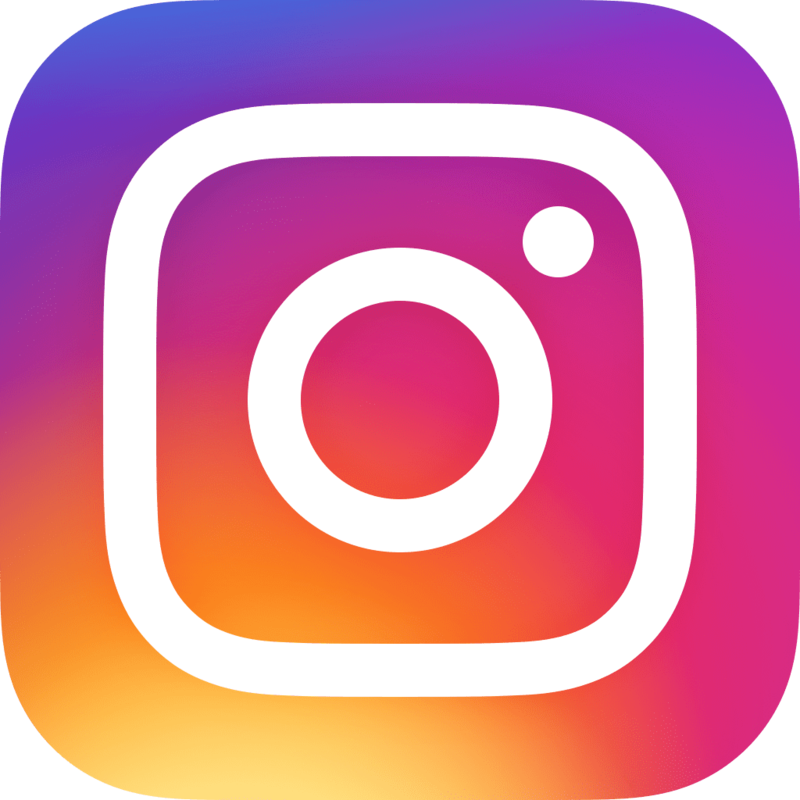 Fluoride, sulfate and hydrogen sulfite are just a few of the extremely powerful ingredients. Regular baths in the thermal healing water are recommended in medicine for muscle tension, musculoskeletal disorders, degenerative joint pain, skin diseases and accident or sports injuries for regeneration. Enjoy the bath in the brine grotto with salt from the Himalayas, the hot sulfur springs, the fountain of youth and many other water attractions. Especially popular with all guests is the lazy river. Varied Aqua Fitness provides a new impetus. Intensive moments of weightless relaxation are guaranteed in the evening light and sound floating with beautiful compositions of color, light and impressive music. What could be more enjoyable than to devote yourself to health, well-being and beauty in a beautiful ambience? The VitalOase offers just a coordinated variety of offer. If you are looking for peace and relaxation, you will find it here. The VitalOase offers health, relaxation and many extras for guests over 16 years. Our own thermal healing water areas, three unique health pools (the vital springs), oxygen garden, two textile saunas and the beautiful Bali Lounge are all part of this. Invigorate the power and warmth of the thermal spa water on one of the numerous bubble loungers in the Vitality Pool or recharge your batteries with the Aqua Active Gymnastics. Relax in the Asian atmosphere in the Lotus Lounge; Relaxation courses ensure regeneration of body and mind. In the vital garden with sun terrace and sand beach comfortable couches and parasols are ready. A blessing for body and soul is the visit to the rose and meditation sauna. Wellness at the highest level in the world’s largest sauna and wellness paradise! 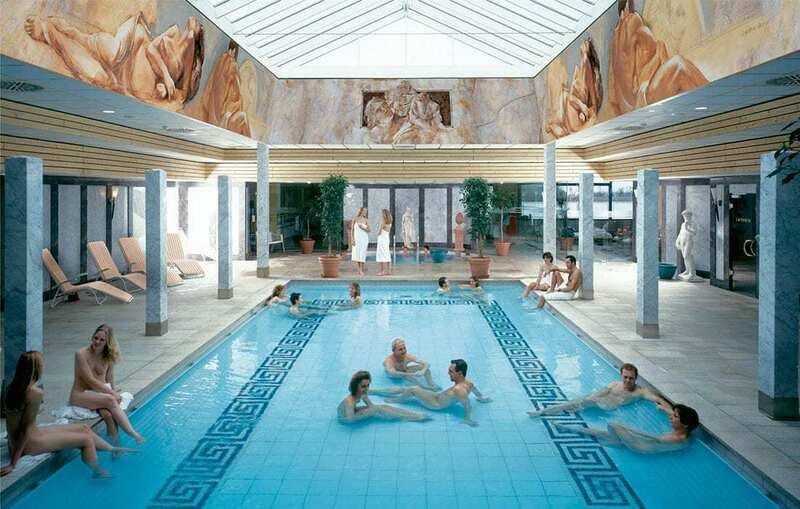 Experience over 12.000m² classic and modern bathing culture in a perfect ambience east of Munich. Warmth, healing water and holiday ambience create an environment of rest, relaxation and health in which everyday thoughts have no chance. Enjoy over 25 differently themed sauna and wellness attractions, aromatic steam baths, generous thermal spa water areas, numerous relaxation oases and a wonderful sauna garden. In the stylish rest rooms of the Roman Villa, the Moorish Alhambra or in the blue salon, on the sun dunes or in the exotic garden of Eden, the last dark cloud of emotion quickly gives way to a pleasant relaxation. Our meditative underwater music in the Vitalbad as well as in the meditation pool of the new sauna paradise offers you a special pleasure – a weightless sound experience! Pure nature can be enjoyed in the imaginatively designed sauna garden with thermal outdoor pool, spacious sunbathing areas, bamboo fog garden and a refreshing natural lake. Slides in Europe’s largest slide world! 20 galactic high-tech railways, including 3 summer slides in the thermal garden, guarantee fun and action on 1,700 slide meters. Three levels of difficulty offer limitless pleasure for all ages and tastes. Only the bravest dare the free flight on the ski slide “High Fly” or race with over 70 km / h through the black and yellow Turbo tube “X-treme”. Even the dive-slip “Kamikaze”, the funnel slide “Space Bowl” or the “Black Mamba” are not for the faint hearted. They enjoy minutes of slide fun in the longest slide in Europe with over 360 meters, whiz through the whitewater current, have fun on the wobble slide or slide in the space glider with sensational upward distances through time and space. 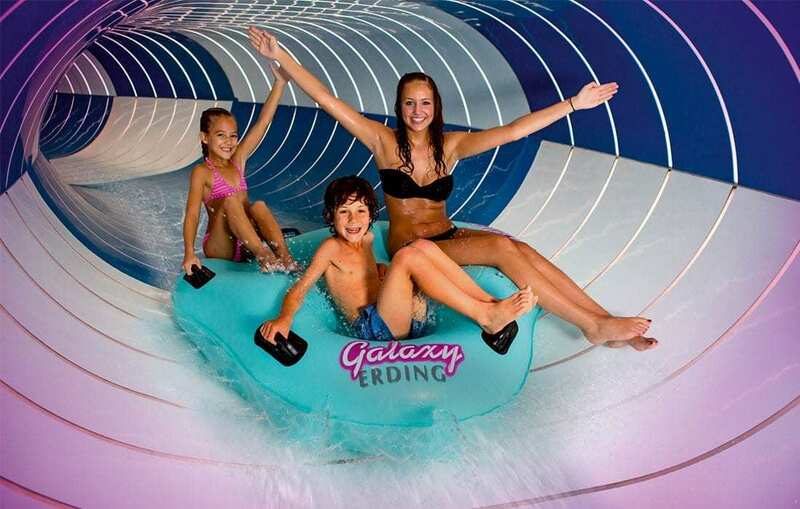 Europe’s leading slide designers have set new standards in GALAXY ERDING!